Medium bodied and full flavored, Carlos Torano Exodus 1959 cigars are hand crafted using a smooth blend of Dominican, Honduran, Mexican, Nicaraguan & Costa Rican tobaccos for a creamy and rich smoke boasting deep flavors of coffee and cocoa. Nice medium to strong cigar. Fun to smoke. This is one of my favorite cigars. I have been smoking these for years. Carlos Torano is one of the oldest farms that originally come from Cuba. 1959 stands for the year Castro kicked them out of Cuba. This is my favorite cigar. Great quality for the price. 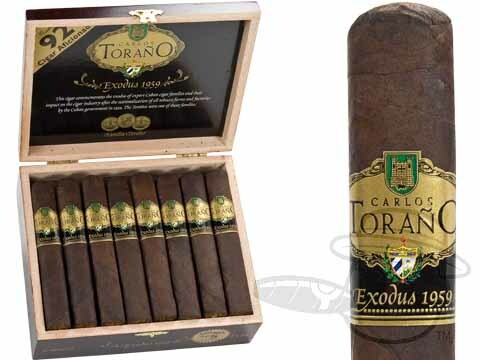 Carlos Torano Exodus 1959 Robusto is rated 2.2 out of 5 based on 4 customer ratings. Yes, this cigar is indeed box pressed. Are the Torano Exodus medium or strong? The Carlos Torano Exodus 1959 series are listed as a medium-full bodied in terms of strength, so depending on what you are used to, it could read either way to you. Also, if you are referring to the 1959 50 Years Exodus it has a Sungrown wrapper, where as the Exodus 1959 features a Colorado Maduro wrap, and of course the different wrapper shades will have a distinct impact on the flavor/strength of the cigar. The Sungrown wrapper is usually a thick, dark wrapper lending a sweet taste to the cigar. The Colorado Maduro is typically a deceptively spicy and full-bodied wrap, providing a nice slow burn and lots of flavor. If you are a fan of fuller-bodied smokes with complex flavor the Exodus series would be a great choice for you.